There are two Biology courses offered during the Fall in alternate academic years, that require scientific diving certification. Kelp Forest Ecology, Biology 161, has twenty-four undergraduate students. They learn the sampling and analytical techniques necessary to conduct their own scientific studies underwater. Identification of kelp forest organisms is part of this learning process. Marine Ecology Field Quarter, Biology 159, has 25 undergraduate students. Students develop a research project during the first four weeks on campus then spend six weeks of immersion in directed research without distraction in isolated locations off campus. Past locations include the Gulf of California in Mexico, Moorea, French Polynesia, Corsica and Sitka, Alaska. If a student is enrolled in Biology 159 no other courses may be taken during that quarter. Ecologist Kristy Kroeker is motivated by a fundamental interest in the drivers of change in marine communities and a desire to improve our ability to forecast and manage the emergent effects of environmental change in dynamic, complex ecosystems. Her lab's research is conceptually grounded in community ecology. They use field and laboratory experiments, synthesis, and modeling to explore the feedbacks between ecosystems and the environment. They also choose to work on issues that are relevant for management, policy, and decision making. They are committed to interdisciplinary collaboration and engagement with decision makers to provide the science needed for solutions. Biology professor Dr. Don Potts and his students dive to collect and photograph corals in order to gather information on the taxonomy, phylogeny and the genetics of these animals. 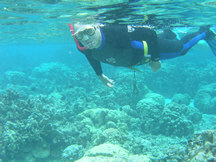 He is concerned with how environmental changes affect the ecology of coral reefs. His group is developing high resolution, aerial, remote sensing techniques to gather biological and ecological data simultaneously over entire systems (e.g. estuaries, watersheds, whole reefs) as a way to define and work on functional units, not just isolated subsets. His studies take him to Australia, the Caribbean, Hawaii, Papua New Guinea and just about anywhere he can find coral reefs. Physiologist Terrie Williams and her graduate students are using scuba diving as a tool to measure the physiological responses of diving mammals in natural environments. 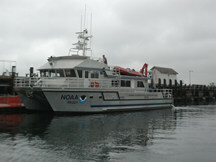 They also use program boats for marine mammal observations in Monterey Bay. By examining the functional relationships between animals and their environment, they can begin to understand the ecological significance of a species and the adaptive changes that may be necessary for its survival. Current research projects in her laboratory include metabolic regulation in swimming and diving dolphins, body condition in declining populations of Stellar sea lions and the pathology of oil contamination in sea otters. Molecular biologist and fish ecologist, Giacomo Bernardi and his graduate students are using molecular and genetic techniques to study the evolutionary ecology of a variety of fishes, including several species of rockfish. They dive to collect fish in the temperate and subtropical Eastern Pacific, the Sea of Cortez in Mexico, and the Indo-West Pacific. 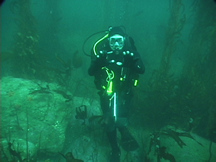 Ecologist Pete Raimondi teaches the Kelp Forest Ecology course with Mark Carr and uses diving as a tool for his studies of larval coral recruitment, and kelp forest communities. He is also involved in a number of applied programs in marine ecology. One recent issue his group has been involved in is the design and evaluation of monitoring programs to determine the impacts from the operation of coastal nuclear and fossil fuel power generating stations. Ecologist Mark Carr and his graduate students are studying the dynamics and structure of populations and communities of temperate and tropical fishes. Currently, they are exploring the roles of, and relationships between, nearshore oceanographic and habitat features, larval supply, settlement and post-settlement processes (e.g., competition and predation) that influence the replenishment and persistence of populations. The Partnership for Interdisciplinary Studies of Coastal Oceans (PISCO) is an inter-institutional cooperative research program of scientific research and training dedicated to advancing the understanding of the California Current Large Marine Ecosystem along the U.S. West Coast. PISCO conducts monitoring and experiments along more than 1200 miles of coastline, as well as laboratory and theoretical studies. During the Summer months PISCO has a need for divers to meet their monitoring and sampling commitments and draws directly from UCSC's pool of scientific divers.